In this post I’ll tell you about trying to reproduce�the Jepsen RabbitMQ test�(using python, not clojure). It’s been more than 2 years since the test, and rabbitmq went from 3.3 to 3.6 meanwhile, so I was wondering if anything’s different these days (end of 2016). Messaging is a legit communication pattern, as nicely documented in the Enterprise Integration Patterns (2003) book, and with the rise of microservices it’s even more relevant that it was 10-15yrs ago. Back in 2013 Kyle Kingsbury started publishing a fantastic series of blog posts called Jepsen where he tested how databases behave in a distributed environment. 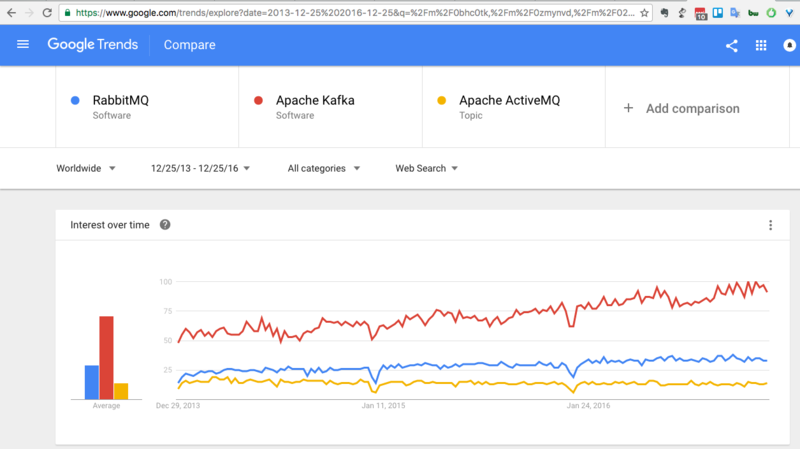 Turned out bad for most of them, RabbitMQ included. In short, under certain failure scenarios, it’s possible to lose data, and losing here means losing a rabbitmq acknowledged write. I was wondering if today (December 2016) things are any different. I’ve been using docker for almost 2 years now, so that was a natural choice for this test. I use Vmware Fusion to run ubuntu xenial, and run docker on ubuntu (you can grab an image from http://www.osboxes.org/ubuntu/). This failed with JSchException: Packet corrupt. ssh-ing once to each node and accepting the host key fixed this problem. Trying lein test again failed with the message “rabbitmq-server: unrecognized service”. 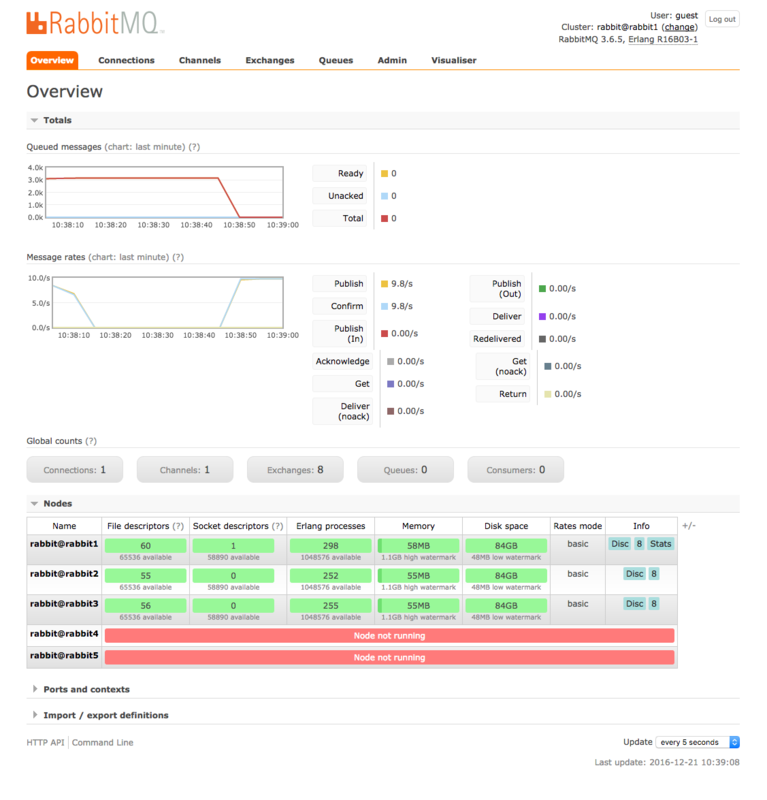 Looking at the console output, the test tried to install rabbitmq only on 3 nodes (out of 5). So I manually installed rabbit on the remaining 2 nodes and ran the test again. It now hangs while starting rabbit. I tried changing the rabbit-test.clj and adding :nodes [:n1 :n2 :n3 :n4 :n5] but it tries to start rabbit on 4 nodes and hangs again. Not familiar that much with clojure enough to debug so a Jepsen bug submitted. $ sudo docker build -t bijukunjummen/rabbitmq-base . $ sudo docker build -t bijukunjummen/rabbitmq-server . rabbit1: image: bijukunjummen/rabbitmq-server hostname: rabbit1 ports: - "5672:5672" - "15672:15672" rabbit2: image: bijukunjummen/rabbitmq-server hostname: rabbit2 links: - rabbit1 environment: - CLUSTERED=true - CLUSTER_WITH=rabbit1 ports: - "5673:5672" - "15673:15672" rabbit3: image: bijukunjummen/rabbitmq-server hostname: rabbit3 links: - rabbit1 - rabbit2 environment: - CLUSTERED=true - CLUSTER_WITH=rabbit1 ports: - "5674:5672" rabbit4: image: bijukunjummen/rabbitmq-server hostname: rabbit4 links: - rabbit1 - rabbit2 - rabbit3 environment: - CLUSTERED=true - CLUSTER_WITH=rabbit1 ports: - "5675:5672" rabbit5: image: bijukunjummen/rabbitmq-server hostname: rabbit5 links: - rabbit1 - rabbit2 - rabbit3 - rabbit4 environment: - CLUSTERED=true - CLUSTER_WITH=rabbit1 ports: - "5676:5672"
all other nodes (rabbit3 doesn’t know about rabbit5 because it was created earlier), so had to go with a DNS. 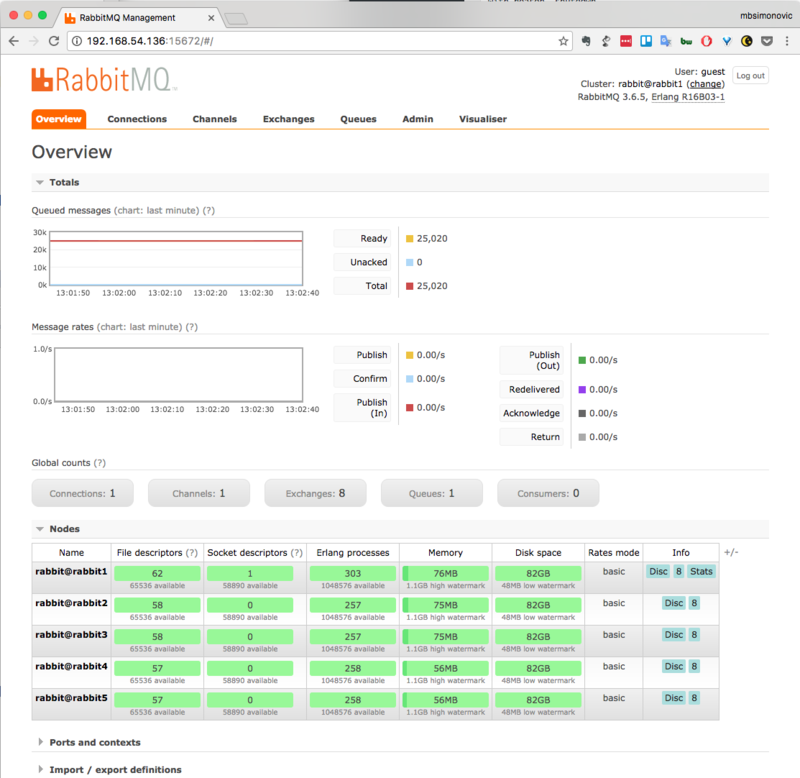 version: '2' services: rabbit1: image: bijukunjummen/rabbitmq-server hostname: rabbit1 ports: - "5672:5672" - "15672:15672" rabbit2: image: bijukunjummen/rabbitmq-server hostname: rabbit2 environment: - CLUSTERED=true - CLUSTER_WITH=rabbit1 ports: - "5673:5672" - "15673:15672" rabbit3: image: bijukunjummen/rabbitmq-server hostname: rabbit3 environment: - CLUSTERED=true - CLUSTER_WITH=rabbit1 ports: - "5674:5672" rabbit4: image: bijukunjummen/rabbitmq-server hostname: rabbit4 environment: - CLUSTERED=true - CLUSTER_WITH=rabbit1 ports: - "5675:5672" rabbit5: image: bijukunjummen/rabbitmq-server hostname: rabbit5 environment: - CLUSTERED=true - CLUSTER_WITH=rabbit1 ports: - "5676:5672"
rabbit2_1 | Warning: PID file not written; -detached was passed. rabbit3_1 | Warning: PID file not written; -detached was passed. rabbit5_1 | Warning: PID file not written; -detached was passed. rabbit4_1 | Warning: PID file not written; -detached was passed. 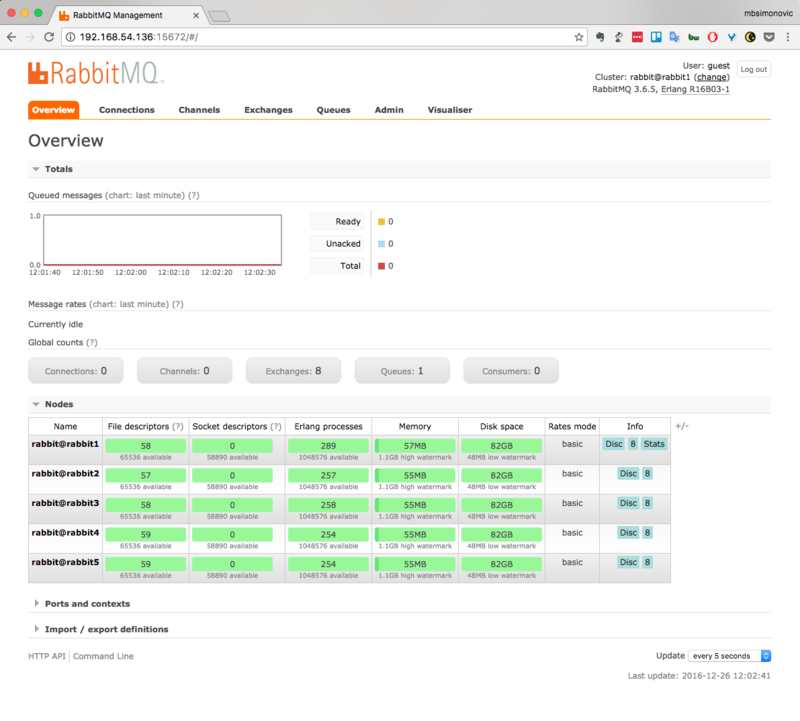 rabbit1_1 | RabbitMQ 3.6.5. Copyright (C) 2007-2016 Pivotal Software, Inc.
rabbit1_1 | completed with 12 plugins. 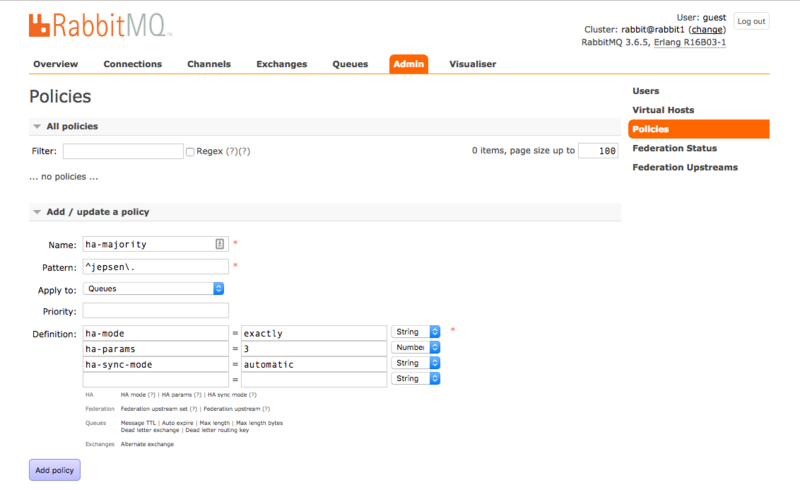 After a few seconds the cluster should be up and running so open http://192.168.54.136:15672/ and login with guest/guest. message = ' '.join(sys.argv[1:]) or "Hello World!" There’s a python port of Jepsen called blockade, so while waiting for jepsen-160, I’ve decided to write my own rabbitmq test using blockade. rabbitmq randomly chooses two more slaves for the queue, and it my case they were rabbit3 and rabbit5, you can find this on the queue tab, under Details. share one Pika connection across threads. ## in jepsen: :content-type "application/edn"
; the message should be re-delivered and we can count this as a failure. # new connection and channel? That’s ok, some are duplicates. Bottom line: 0 messages lost. I’ve found a great post by Balint Pato�where he explained how he managed to reproduce the Jepsen results. Unfortunately, his code and setup are not publicly available, so until he gets it out, I’ll try to reproduce his results. Stay tuned, more posts coming..
5.1.17 UPDATE: second post available where I try different partitioning schemes.